CSM Joe Mattison was born to Ron and Earsol Mattison on April 16, 1955, in Bordeaux, France while his father was station with the US Air Force at Chatearoux Deols Air Base. Later when his dad was assigned in Alaska, Joe was sent to live with his aunt and uncle, Rena and Down Cowels in Cuba, New York. Later they relocated to Wellsville, New York, where Joe called home. He graduated from Wellsville High School in 1974 where he participated in varsity sports and was a member of the ski team. Joe enlisted in the US Army as an infantryman under the then, Airborne Ranger option. CSM Mattison was an original member of the 1st Battalion (Ranger) 75th Infantry at Fort Stewart, Georgia. He was assigned to Bravo Company. Approximately three years after the forming of the 1st Ranger Battalion, Joe was reassigned to Alaska and the Northern Warfare Training Center. He served as an instructor from 1977 to 1979. It was after this assignment that Joe was transferred here to the 2nd Ranger Company as a Ranger Instructor. Here he served with distinction from 1979 to 1984. Of course, because of Joe's known leadership capabilities he was asked to help form the cadre of the 3rd Ranger Battalion at Fort Benning. Joe served in various capacities until Joe was returned to the 5th Ranger Training Battalion at Camp Merrill where he served until July 1988. In August of that same year, Joe was again reassigned to the 3rd Ranger Battalion as the Alpha Company First Sergeant. While serving, he participated in the combat jump into Panama as part of Operation Just Cause. He also participated in Operations Desert Shield and Desert Storm in southern Turkey and northern Iraq in 1991. When he left the Ranger Regiment, Joe had served in every noncommissioned officer leadership position from team leader to first sergeant. Joe followed up this extensive experience with an assignment as Operations NCO for the 3rd Battalion, 325th Infantry (Task Force Lion) in Vincenza, Italy, from 1991 to 1993. He then attended the Sergeants Major Course in Ft Bliss, Texas in 1993. His next assignment to 2nd Squadron, 5th Cavalry, 1st Calvary Division, Ft Hood, Texas from 1993 to 1994. His next posting was the 3rd Battalion, 22nd Infantry Regiment, 25th Infantry Division, Fort Shafter, Hawaii from 1994 to 1996. It was back here in Dahlonega, GA that CSM Mattison ended his distinguished military career as the Command Sergeant Major for the Mountain Ranger Camp in 1998. 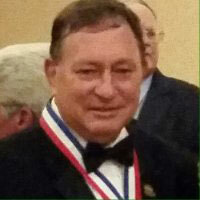 His military awards include the Legion of Merit, Meritorious Service Medal (4th award), Joint Services Commendation Medal, Army Achievement Medal, Army Achievement Medal (5th award), Joint Meritorious Unit Award, Army Good conduct Medal (8th award), National Defense Medal, Armed Forces Expeditionary Medal with arrowhead device, Southwest Asia Service Medal (with one Bronze star), Humanitarian Service Medal (2nd award), Noncommissioned officer's Professional Development Ribbon with numeral 4, Army Service Ribbon, Overseas Service Ribbon, (3rd award) Expert Infantryman Badge, Combat Infantryman Badge, Master Parachutist Badge (with one bronze combat Jump star), Pathfinder Badge and the Ranger Tab. Joe had a matter-of-fact attitude and had come to be known as a specialist in military data. He always had the answer to any question when it came to protocol, weapons, administration and military history. Early trivia master you might say. While serving as Command Sergeant Major at Camp Merrill, Joe wrote a flattering piece that described a Ranger Instructor as one who has no equal. He went on to say that "We have done our best, to the best of our ability and ask for nothing more except: Take over from here. Our students are alive and ready to be moved on to the next phase of Ranger training. This is the signature of a Mountain Ranger Instructor"! CSM Joe Mattison is survived by his three Children, Samantha, Adam and Shiloh, and his ex-wife Jan. Joe Mattison was a true Ranger with the spirit of Robert Rogers in his soul. He commanded respect and earned it through his care for his unit, his country and his Ranger brothers. He upheld the high Esprit de Corp of the Ranger Regiment and will be sorely missed throughout the Ranger community and the US Army. CSM Joe Mattison was truly a Ranger by the Book.